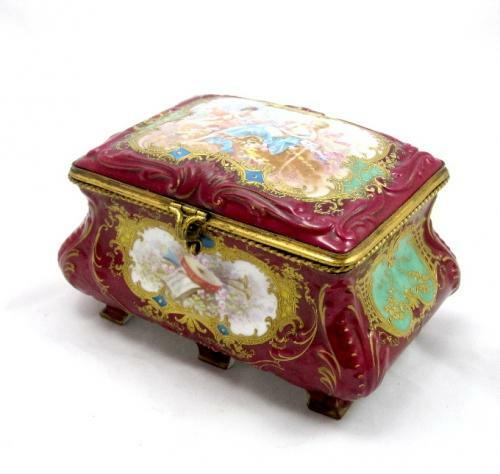 A Rare Antique Sevres Porcelain `Bombe` Jewelery Box with a Fine Quality Hand-Painted Utopian Scene of A Lady and a Cherub on the lid and Musical Instruments on the Front. Signed on the Lid and Marked Sevres 1846, Chateau des Tuileries on the bottom. This graceful and rare casket was made by the Royal Sevres Porcelain Manufactory during 1846 for chateau Tuileries of Louis-Philippe. It has the LP mark which represents King Louis-Philippe, a Red mark for Chateau Tuileries, and also the LL mark of the Royal Sevres Porcelain Manufactory in respect to the King Louis. This describes that this work was crafted by the Royal Sevres Porcelain Manufactory for the chateau Tuileries by the direct order by the King Louis-Philippe. Sevres was owned by the Royal Family and every porcelain crafted here were directed by the king for decoration or equipment for the Palace of Versailles and other imperial villa, or a gift for the royal families in the foreign countries, thus the public hardly had a chance to see these works. For almost two and half centuries as a national porcelain manufacturer, Sevres established unique French design different from the public manufacturer. Today, most of the porcelain works of French culture and beauty are offered to Palais de l'Elysee (president's residence), and receiving orders from Royal families outside the country for special ceremonies. It is so called the 'dreamlike porcelain' from its rarity.